A few years ago my apartment community had a Superbowl party/chili cook-off and I wanted to bring something to the party. I’d never made chili before in my life, but I thought, “How hard could it be?” In preparation I went online and looked at a few dozen chili recipes and took note of preparation styles and ingredients I thought would be tasty. Then, armed with a list of ingredients I went to the store, browsed for some more additions, and came home with a massive supply of additions to the larder. Be forewarned: this chili ain’t cheap. This chili will do that for you. I guarantee it. So, in the spirit of good-will, I share my recipe with you. It truly is a tasty recipe, but feel free to modify it to suit your own tastes. 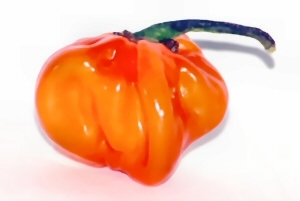 1 habaÃ±ero chili pepper, very finely diced—handle carefully or with gloves! This chili may take up to an hour or to prepare—depending on whether you chop vegetables by hand or not. Best tip: get your friends to help you make the chili. According to unverified reports, it tastes great cooked quick as well as slow, but your mileage may vary. I prefer using the slow cooker with timer for my chili and letting the flavors come out overnight. Sear the onion, garlic, and bell peppers before placing in crock pot—don’t cook them fully, you just want to lightly carmelize the vegetables for a sweeter taste (look for golden color on the onions). Toss the habaÃ±ero into the crock pot raw. Prepare the remainder of the vegetables as shown above and place in bottom of 4-6 qt. crock pot. Add all spices. Optionally, you could prepare the spices before hand and cook them into the meat. This will bring out more of the flavor and infuse it with the meat. Combine meat, brown in skillet with olive oil until all pink in the meat is gone, and drain fat before adding to crock pot (drain fat if desired, there’s depth of flavor in the fat, but when your chili cools it’ll have a thick skin on top if you don’t drain it). If all the meat doesn’t fit in your skillet, divide in batches. The browning is an important step because it brings out greater flavor in the meat. (Some like to add the spices to the browning process to infuse the meat with more flavor. This is why I like to use the Sage sausage, by the way.) Feel free to use the hickory smoke here—or any of the other spices, or add directly to the crock pot if you want. After searing both the vegetables and browning the meat, add a little wine or water to the skillet and cook over flame, stirring sides with a ladle to loosen what was left behind—add this to the crock pot. Finally, add your tomato paste and picante/chipotle sauce last. Cover crock pot. After an hour or two stir contents once. Leave covered for 7-10 hours. In the last hour, add vinegar as flavor enhancer. At this time add more brown to taste. Serve with grated cheese and chilled sour cream. Ahhh… the ultimate compliment. Short of slavish duplication, that is. (grin) Hope it works out for you! Amazing chili crock pot recipe. The mint is a treat. Thanks, Steve, for the kudos. Am I to assume you’ve tried the recipe out? If so, how’d you like it? I did not try your recipe. This year I plan to throw out mine and try to make a competition style chili. I want to see if I can stick to the rules, and end up with a really good chili. Try to resist throwing in shoe leather, will you? Mushrooms, mint, and curry? What kind of unholy concoction are you trying to spring on us Rich??? And all this time I thought this was a ‘Christian’ Blog. If you do venture out to brew this savory concoction, please let me know how it works out for you! My husband and I are entered into a chili cookoff. We are competing against each other and neither of us has ever cooked chili before. Should be interesting. I am using yours and he will be doing one with deer meet. YUK! I have a feeling I will win. I’ll keep you posted. It’s for our local Disabled American Veterans Chapter meeting. wikied it and found they are both the same plant. What we call Cilantro in the USA is called Coriander Leaves in the UK. What we call Coriander is Coriander Seeds in the UK . Hey! Great tasting chili, but is there something i can do to add some liquid to it, without losing the great flavor? It seems really thick….uh…unless it’s supposed to be that thick.